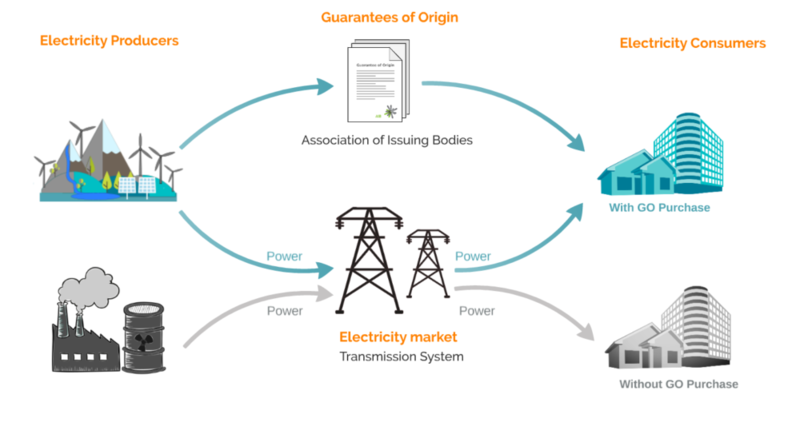 The Guarantee of Origin (GO) is the main and only electricity tracking instrument in Europe that gives electricity consumers the power to actively choose sustainable power production over fossil-fuel based and hence send market signals about their demand. A Guarantee of Origin (GO) is a tradable commodity that represents a claim to the environmental benefits associated with renewable power generation. GOs are traded electronically in the voluntary market for renewable energy certificates and are not tied to the physical delivery of electricity. A GO indicates the generation of one megawatt hour (MWh) of electricity from an eligible source of renewable power. Each GO denotes the underlying generation source, location of generation, and year of generation (a.k.a. “vintage”). The trading market in Europe includes GOs from wind, hydropower, solar PV, geothermal and biomass sources for now. How does the tracking process work? Each GO is assigned and identified by a unique number. Similar to an online banking system, it is then tracked accurately by established authorities in Europe as it changes hands from the producer to the broker/supplier and finally to the consumer. This ensures there is no double-counting in electricity disclosure and the green electricity contracts are reliable. Examples of issuing bodies are: Svenska kraftnet in Sweden, CertiQ in Netherlands, Fingrid in Finland, Statnett in Norway and UBA in Germany. For Utilities and Power suppliers: The European IEM (Internal Markets Electricity) Directive requires all electricity suppliers to disclose their energy portfolio to their customers with regards to energy source and all the relevant environmental impact indicators. The GO system provides an efficient and simple means of tracking the impact from generation based on attributes of electricity and facilitating disclosure. Purchasing GOs also enables the suppliers to provide green power tariffs and products to their customers. For Companies: GOs are a flexible and efficient tool to help companies achieve their clean energy goals and support production of renewable energy where it is the most optimal. In an organizational context, one of the main benefits of sourcing renewable energy through GOs is that the company can claim zero emissions for that portion of consumed electricity in their carbon footprint report. They can also choose to source GOs from a specific power plant based on additional sustainability criteria and use that information in their marketing and communication. For a brief overview of the GO system, please view the video below.